We’ve optimized the OnePlus Micro-USB cable for maximum durability and easy storage. While traditional round cords tend to get tangled, we’ve equipped ours with a flat cable and handy silicone tie to solve the problem for good. In your bag or on your desk, you’ll never have to worry about tangled cables again. Bold and eye-catching, the OnePlus Micro-USB cable embodies the superior design and craftsmanship you’ve come to expect from OnePlus. As durable as it is beautiful, we’ve rigorously tested our connectors to ensure the highest levels of dependability. Our attention to every detail is a true testament to the Never Settle philosophy. 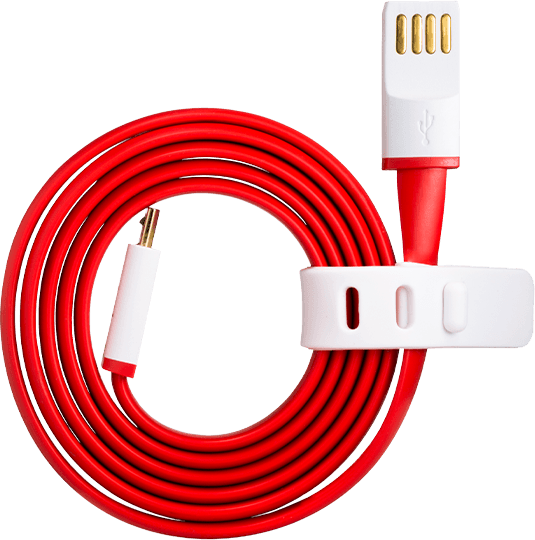 The OnePlus Micro-USB cable features gold-plated connectors and oxygen-free copper wire for a connection that is both stable and blazingly fast. Allowing for speeds up to a staggering 480Mbps, transferring large files and charging your device has never been so quick and easy. OnePlus X, OnePlus One and other Micro-USB devices for both data transmission and charging.